Let’s say something about SPI. SPI (or Serial Peripheral Interface) is a protocol named by Motorola. With him you can control sensors, SD card and much more. 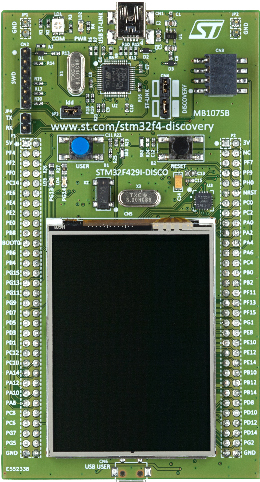 SPI protocol works in a ways where there is one master and multiple slaves, In other words, master is our STM32F429 Discovery board and let’s say, SD card is slave. A lot of times when you work on some project, you want to display data on computer. This can be done with USART peripheral on MCU. With USART you can connect more than just computer, you can connect with GSM modules, GPRS, bluetooth and so much more. for some delay, to actually see how led was blinking. We didn’t know at which clock speed our processors work and for first time, I think you didn’t even ask yourself. Your first blinky project works, but you don’t know how? I will explain GPIO (General Purpose Input/Output) CMSIS Library. This library is used to work with physical pins on microcontroller. You can set pins to input or output, put them low (0 volts) or HIGH (3,3 volts), select pull resistors, choose output type and select clock speed.